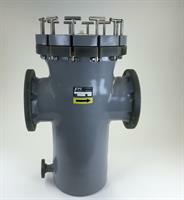 Fluidtrol manufactures non-metallic basket strainers for a variety of industries. Commercial Aquatics is about 1/2 of our business- products are used for commercial pools, waterparks, zoos and aquariums. The other 1/2 is industrial applications such as oil/gas, steel, mining and power generation. Our specialty is corrosive systems- so seawater and other chemical systems are users of our products.